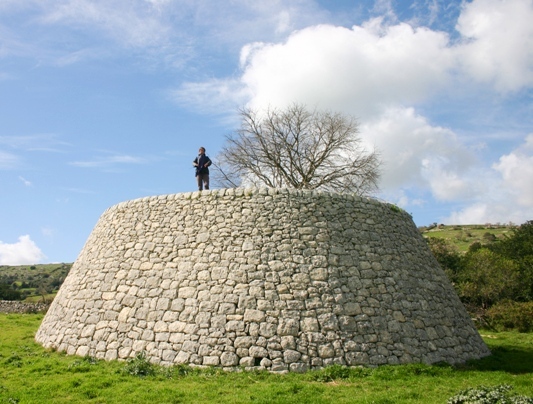 I first read about muragghi in a book by a local historian named Paolo Tiralongo, and when I discovered that one of the largest and most beautiful was not far from my house in Sicily, I went off on a search. So, what the heck was I looking for? Muragghi are stone constructions, built to contain rocks. Wait, wait, don’t run away, they are really cool! Stunning in workmanship and sheer labor, it is difficult to believe that these 16th century stone towers were built simply to contain rocks that were cleared from fields. Their majestic and mysterious presence in the countryside of Ragusa makes them appear as a monument or gathering place for some strange cult. Most are in the midst of lovely countryside that has thankfully been spared much of the hideous building that is all too rampant in Sicily, so the view from the top is wonderful. Slightly conical in shape or made like a huge stone wedding cake, there is also a stairway built into the muragghi. On a walk near the old feudal estate of San Filippo, I find this simple yet beautiful muragghio, and I climb to the top to find a stubborn bagolaro tree firmly rooted in the rocks, and vow to return in summer to sit in its shade. The larger the feudal holding, the more land had to be cleared, so a larger, grander muragghio was the result. Which brings me to the amazing wedding cake muragghio just a few kilometers from where I live. Even after spotting it in the distance, it took me a while to figure out a way to get there, with Proprietà Privata signs, barbed wire fencing and deep ditches acting as deterrents. 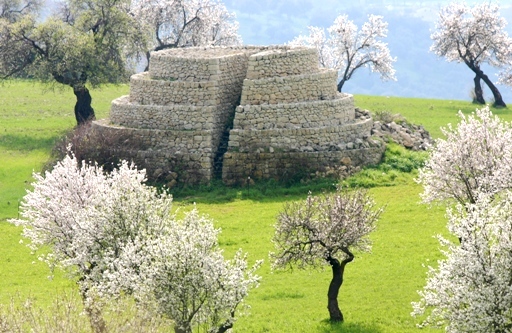 But finally, on a glorious late winter day with the almond trees in bloom, I find a sort of pathway through thick mud, and tromp towards the stone wedding cake. It is hard to gauge the size of this muragghio from a distance, and as I approach, it seems to grow to massive proportions. On one side there is a wedge cut into the muragghio – like a slice of missing cake – where a stairway is built. I climb to the top and the feeling is powerful, mysterious and somehow melancholy. I can’t seem to help feeling sorry for the contadini who toiled to build this rather absurd thing some 500 years ago. In the end, the beauty of the countryside has a calming effect. My view stretches across almond orchards, olive groves and pale fields green fields of early wheat, with the sea shimmering in the distance. To the north, the snow-covered Mt. Etna volcano peeks over the horizon. This is a moment in which I cannot help but love this crazy island that is Sicily. Thanks, Anita. This is so beautiful and I had never heard of these let alone seen one. Loved reading about these, and the pictures are fantastic. How bizarre that the function is simply to house errant rocks! But, how wonderful. So glad you’re doing this blog Anita… love the immediacy and your sensibility as you move through the countryside. Feel like I’m there with you — IF ONLY I WAS!! Missing Sicily and the marvelous A & E!! These look very similar to some of the Pajare that we came across in Puglia, and to others in western Malta. 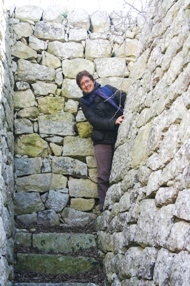 Some of the Puglian ones have an external spiral staircase set into the walls. We are heading for Sicily in a couple of weeks and have found lots of inspiration for ‘off the beaten track’ ideas to explore. We would love to be able to track down some of these muragghi if you feel able to give us directions via my email. Many thanks for the inspiration – and the recipes! Probably a case of the nobility( the original mafia in my opinion) making sure that their peasants didn’t have too much spare time!